When one’s grandson is more interested in playing Minecraft (a sandbox video game) than in eating healthy vegetables, a grandmother must become creative. Start with a package of “experience orbs” and “acacia wood blocks” (frozen peas and carrots). Top with flaming axes and swords (carved carrots). The photos below explain how to make the latter. When you’re done, top with butter, salt, and pepper—or your favorite sauce—and watch young warriors take a renewed interest in vegetables! 1. Peel fresh carrots. 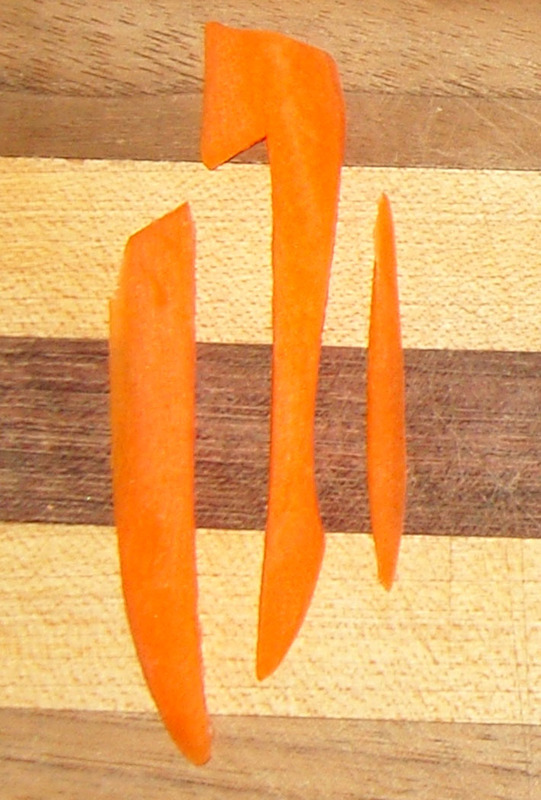 Then, using a sharp paring knife, cut each carrot into thin slabs. 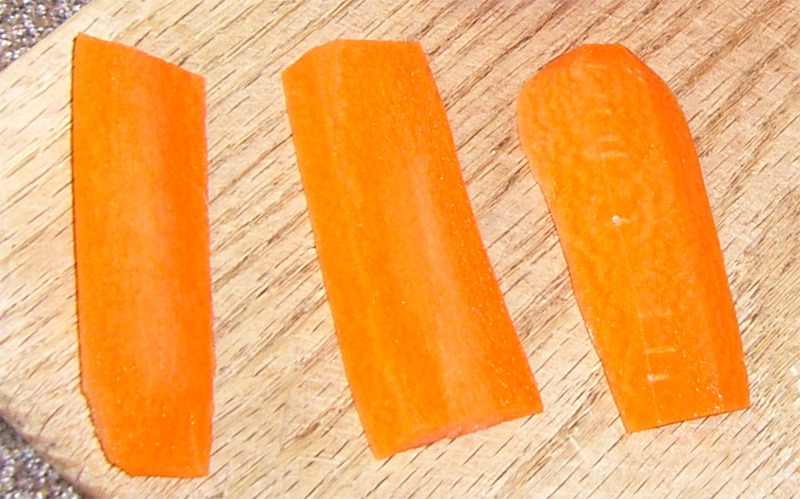 Make each carrot slab about 1/16th inch thick. 2. To make an axe, slice a notched piece from under the axehead and along the length of the handle on one side. Then cut a long piece away from the opposite side of the handle. Your grandchild may comment on the axe’s resemblance to the number 7. 3. To make a sword, take the widest scrap left over from axemaking and cut little squares away from either side at the top. Then cut elongated triangles further down, creating a cross guard. Taper the rest of the blade into a point. 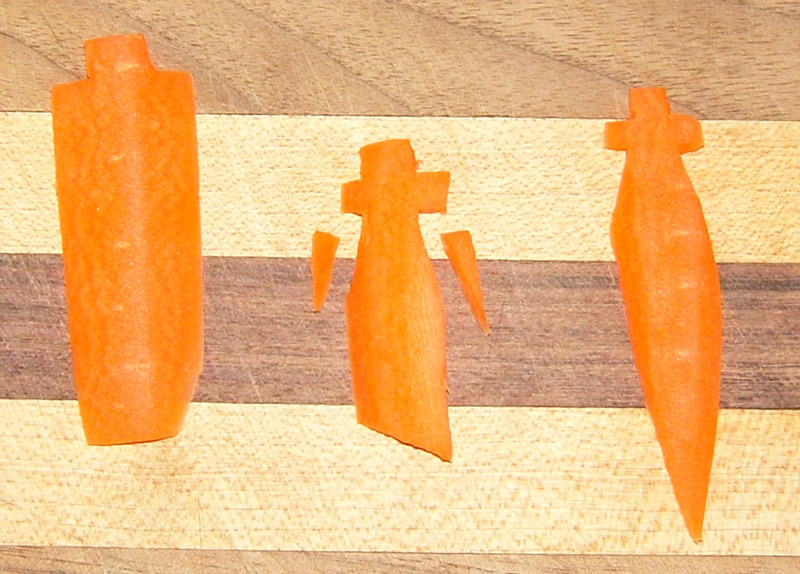 This illustration shows how a dagger can be made from a carrot slab itself. 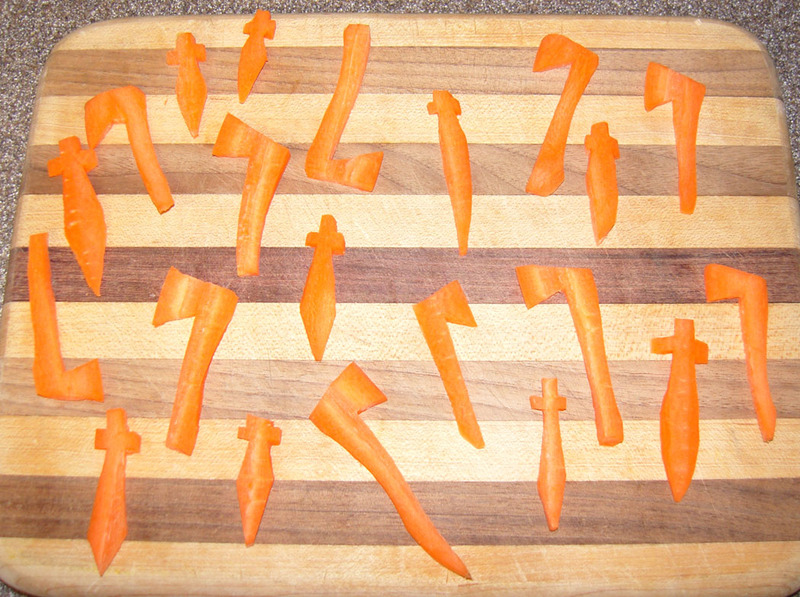 A longsword can be fashioned from a narrower piece of carrot. 4. 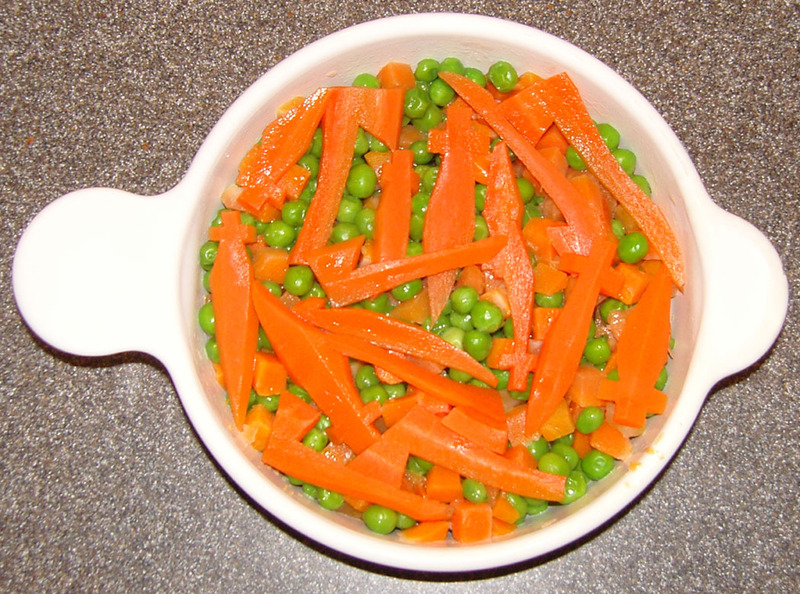 The resulting axes and swords (or sevens and crosses, if your progeny prefers) can be precooked to the tender-crisp stage before being added to the package of frozen peas and carrots to finish cooking. This entry was posted in Creative Concoctions, Food Frugalities, PiggyBanker Kids, Uncategorized and tagged chef art, children, creative solutions, Minecraft, vegetables, veggies. Bookmark the permalink.